Western Blot analysis of 1 µg V5 tagged HuCAL Fab-A-V5Sx2 loaded into lanes 2-6. Bio-Rad Precision Plus molecular weight marker was run in lanes 1 and 7. Mouse anti V5-tag antibody (MCA2894F) was used at a dilution of 1/200 in lane 2, 1/1000 in lane 4 and at 1/2000 in lane 5. Membrane visualized on the ChemiDoc™ MP Imaging System. 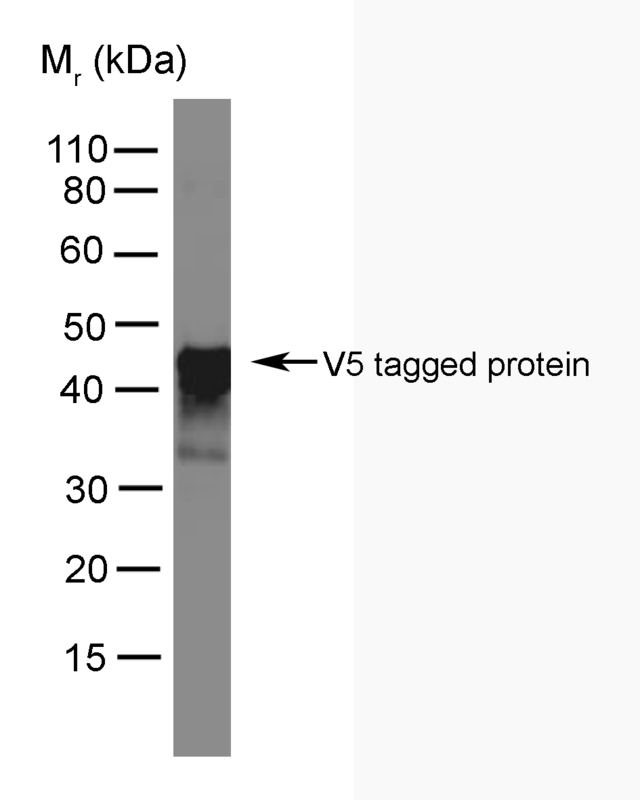 Mouse anti V5-Tag antibody, clone SV5-Pk4 recognizes a small epitope, termed Pk, present on the P/V proteins of the paramyxovirus, SV5. 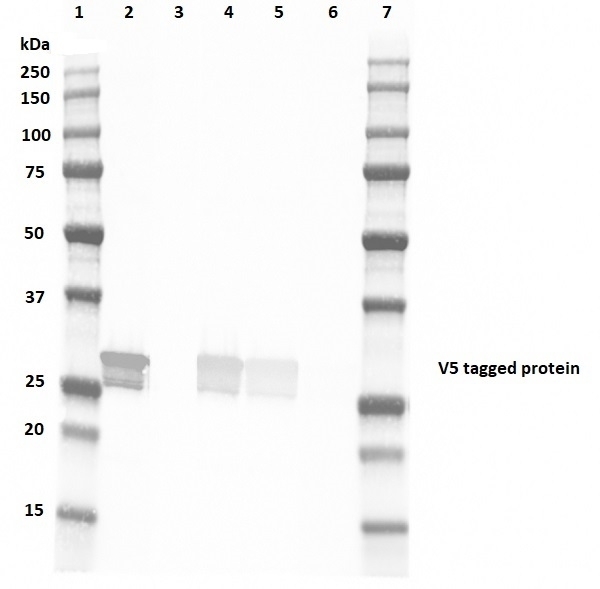 Mouse anti V5-Tag antibody, clone SV5-Pk4 has been used to detect recombinant proteins, some of which include transmembrane and secreted proteins, which have been tagged with this epitope. Usually, a 14 amino acid tag has been added to the recombinant proteins, although a smaller epitope of 9 amino acids (that as a peptide inhibit the binding of the monoclonal antibody to its native protein) has also been successfully used. The 14 amino acid epitope is; gly lys pro ile pro asn pro leu leu gly leu asp ser thr. (The 9 amino acid epitope is underlined). A recombinant peptide corresponding to the PK tag fused to a class II - restricted T helper cell epitope. This product is manufactued under an exclusive license from the University of St. Andrews, UK. Dunn, C. et al. (1999) Fine mapping of the binding sites of monoclonal antibodies raised against the Pk tag. J Immunol Methods. 224 (1-2): 141-50.